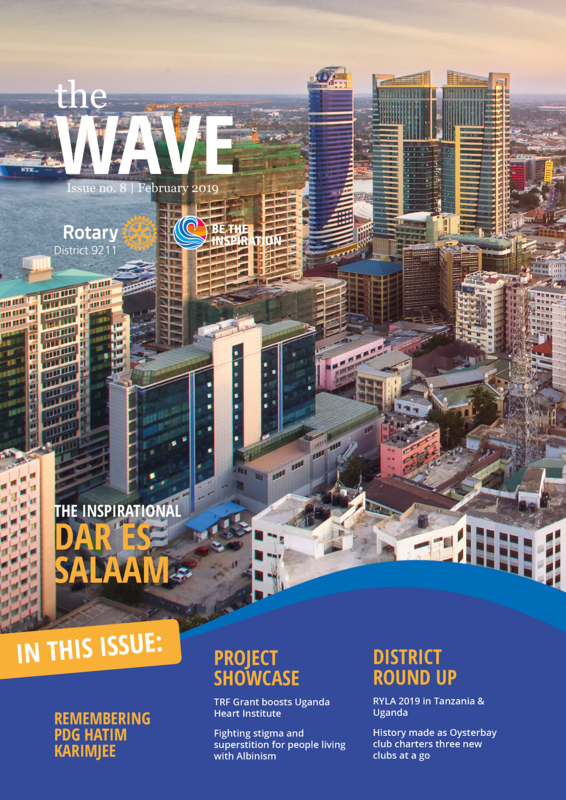 Welcome to the February edition of the Wave. February is for peace and conflict resolution month for us here at Rotary and for love for the rest of the world! We started the year on a very sad note with the news of the death of the larger than life Past District Governor Hatim Karimjee. His dedication and love for Rotary was unquestionable as was his love for life and humor. In my club, Rotary Club of Mikocheni, he never turned down a single invitation to grace any occasion, no matter how big or small. He never missed an opportunity to talk about Rotary. His death is a big blow and a loss of institutional memory. We pray for his soul to rest in peace and let us continue to build Rotary to honor him. History was made in Tanzania in January when the Rotary Club of Oysterbay chartered not one, not two but three clubs at a go. The colorful event was graced by DG Sharmila Bhatt and other senior District officials and Rotarians from Dar es Salaam and friends and family. The only blight was that the late PDG Hatim from RC Oysterbay did not live to see this historical event which he was part of. Congratulations President Vikash and the whole of RC Oyster bay for this feat. And a warm welcome to the over 80 new Rotarians. We also bring you photos and stories from this event. January was also a busy month for the new generation teams in the two countries. Rotary Youth Leaderships Awards and interact club boot camps were held in various locations in Tanzania and Uganda. Read on to learn more about this. Investing in the future leaders of the world and Rotary today is what we do best. This April, all roads are leading to Dar es Salaam, for the 94th District Conference and Assembly. What is in store for us all in Dar es Salaam? How will Dar es Salaam inspire you? That is the focus of this month’s inspiring story. Read recommendations from city itself on what to do and on why Dar es Salaam will inspire you! And why if you have not signed up for DCA, you should.